It’s hard to argue against the convenience of using a smartphone as a camera, a concept that hasn’t been lost on camera manufacturers. But making a dedicated camera that can rival the portability and simplicity of a phone is no easy task. Even if the image quality is much better, just getting people to pick it up and use can be a challenge. The Olympus PEN series is about as close as interchangeable lens cameras get to smartphone size, and that alone is worth giving the series some credit. The PEN E-PL9 is the newest in the series, a beautiful, entry-level model that sits alongside the older, but more premium PEN-F. Based around the same 16-megapixel Micro Four Thirds sensor as the E-PL8 with the same 3-axis in-body image stabilization, it doesn’t offer any huge quality or performance gains. It does offer some modest upgrades in other areas: Burst rate has seen a slight bump to 8.6 frames per second from 8.5, while autofocus density has increased to 121 focus points from 81 — both impressive numbers for this category. 4K video is also new; a nice touch, if not a huge selling point for the casual user. But, as refined as it appears on the spec sheet, the $599 E-PL9 (body only, $699 as tested with kit lens) finds itself in a sort of awkward middle ground. No matter how you shake it, it’s not as convenient as your smartphone for casual photography, but it also flounders under more serious use as its beginner-friendly controls make manual operation more difficult. Rationally, this is the camera you want to recommend to your friend looking to boost the quality of their Instagram feed, but deep down you can’t help but wonder: Will they actually use it? If we could score a camera on looks alone, the E-PL9 would receive a 9.5 (we’ve got to save that extra 0.5 for the meticulously styled PEN-F). The physical changes over the E-PL8 are minimal, but the new angled grip gives it a slight ergonomic advantage. Paired with the impossibly small 14-42mm retractable kit lens, it’s a great looking piece of kit. Our review unit came wrapped in white faux leather, but brown and black are also available, along with a special edition blue that’s new to the E-PL9 and looks absolutely droolworthy in photos. Yes, we know, a pretty camera doesn’t mean it takes pretty pictures, but like it or not, this might help people take it out and use it more often, so that’s something. 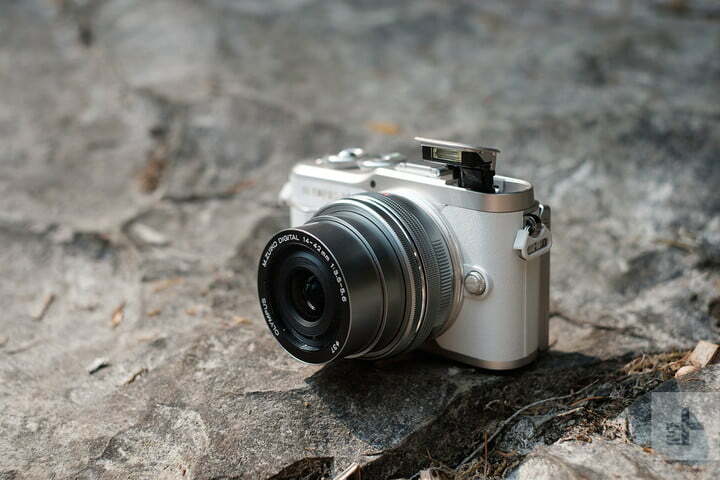 If we could score a camera on looks alone, the E-PL9 would receive a 9.5. New to the E-PL9 is a built-in, pop-up flash. As always, on-camera flash should be used judiciously, but when you need it, it’s certainly more convenient to have it built-in than having to attach a small external unit, as was required for the E-PL8. More interesting, that flash also enables wireless flash control of up to three groups of remote flashes, a surprisingly high-end feature for an entry-level camera. 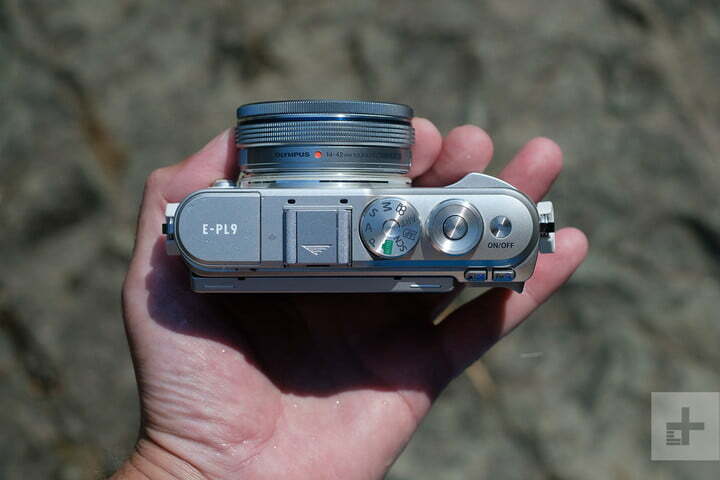 Of course, the E-PL cameras have always been about the casual shooter, and the E-PL9 is no different. The LCD screen is unchanged, measuring 3 inches and able to tilt just shy of 90 degrees up and a full 180-degrees down for low-angle shots and selfies, respectively. It is touch-sensitive, and responsiveness is quite good, even if it’s not immediately clear which onscreen elements can be accessed via touch and which require using the physical controls. There is a single command dial, and this is where things can get a bit confusing for experienced photographers. In program auto, shutter priority, or aperture priority, you can hit “up” on the four-way controller to toggle exposure compensation (in manual mode, this will switch from shutter speed to aperture control). However, if you are using the touchscreen to select an autofocus point (inarguably the easiest way to do so), this more-or-less locks you out from being able to toggle exposure compensation, as hitting “up” now simply moves the focus point. To get back to exposure comp (or aperture control), you first need to press “OK,” which then reverts the focus point you just selected on the touchscreen back to wherever it was before you touched the screen. There are two ways around this. First, you can opt not to use the touchscreen to set a focus point, instead pressing “left” on the four-way pad to bring up the focus array and select your desired point with the directional buttons. When you then press “OK,” it will now lock in the selected AF point, rather than revert back to the default. Second — and this is our preferred method — you can dive into the settings menu to reassign exposure compensation to the function/magnifying glass button (located just behind the on/off button). Now you can access your exposure controls and touch autofocus together, but we wish it didn’t requiring jumping through hoops like that. For more immediate results, you can also just turn on touch shutter, which will focus and take a picture with a single tap on the screen. This actually works quite well, although we prefer separating the focus and shutter actions, not to mention using the physical shutter button — call us old school, but it just feels better. 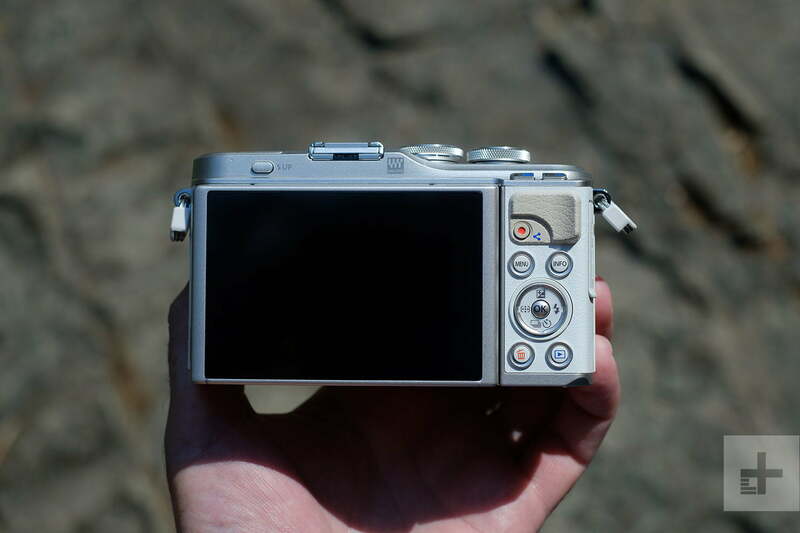 We spent two days camping with the PEN E-PL9 in the lush wilderness of Washington’s Gifford Pinchot National Forest. Minus the lack of dust- and splash-proofing, it’s the perfect camera for day hikes, riverside gatherings, and campfire cooking. You can toss it in jacket pocket, purse, or other small bag and it’s light enough that you’ll barely know it’s there. Battery life is rated for 350 exposures, which is low enough to be considered “bad,” but it was still plenty for our excursion. This is the camera you want to recommend to your friend looking to boost the quality of their Instagram feed — but will they actually use it? There is one other advantage of using a camera like this: It helps you blend in, even when you’re just trying to blend in with your own friends. You can easily shoot from the hip, and when you’re not holding a camera in front of your face, you feel much more a part of the action and other people act more naturally around you. It’s great for street photography, particularly with the compact lens. But, while we were setting up at the base of a waterfall with tripod and neutral density filters in hand, we encountered a depressing reminder of the futility of our efforts when a group of three young people showed up and began posing for each other for what we can only assume was a very important Instagram photoshoot. They spent no less than 45 minutes trying to get the perfect pose, angle, and moment in front of the rushing waterfall — and the entire time used nothing but their phones. This went far beyond “casual” photography, yet apparently a phone was just fine. But those with at least a passing interest in actually learning photography owe it to themselves to invest in an interchangeable lens camera, and the E-PL9 seems like the perfect introductory model — at least, at first. The issue here is that it doesn’t leave much room to grow into. This is a camera designed to be shot in automatic mode, and while some people will undoubtedly appreciate that, those are the same people likely to just stick with their phones. Of course, you can’t escape the phone completely. Like nearly all cameras today, the E-PL9 can pair with a phone to upload shots to social media. Perhaps that isn’t convenient, but at least your Instagram shots will look great. Even though it’s not built on the latest and greatest tech that Olympus has to offer, you can still throw a high-quality lens on the E-PL9 and get great results. In addition to the kit lens, we tested it out with the premium 17mm and 45mm F1.2 Pro lenses, and you’d really have to study the images up close for any sort of tell that they weren’t shot on the $1,700 E-M1 Mark II. That said, you still have to contend with the inherent limitations of Micro Four Thirds sensors, which are physically smaller than APS-C and full-frame sensors found in other mirrorless systems. Even at the base ISO of 200, images have a noticeable amount of noise in the shadows. You won’t see this if you’re just outputting to social media, but if you want to view your images up close on a monitor or make large prints, this is one area where a larger sensor will produce better results. However, a larger sensor would necessitate a larger camera and optics. When you take into account the size advantage of Micro Four Thirds — in particular the half-pint stature of the E-PL9 — we really can’t complain. Add to that the built-in image stabilization, and getting a good photo is just about as easy as it gets with this camera. 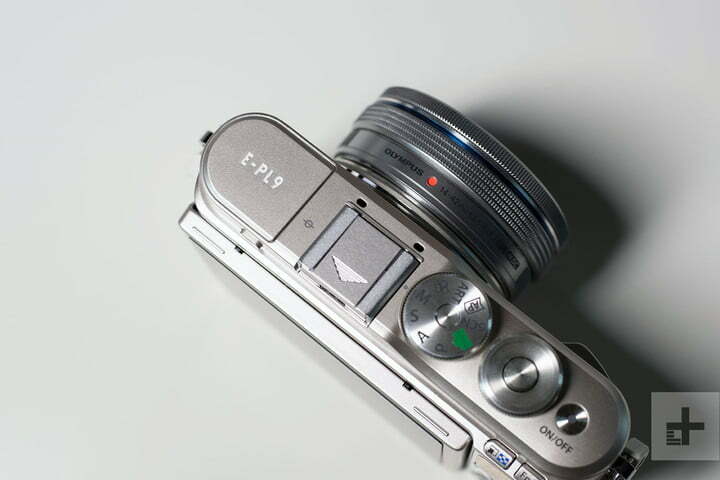 As with other Olympus cameras, the E-PL9 also has a host of scene and “art” modes for creative in-camera effects. Many of these are borderline gimmicky, but the high dynamic range (HDR) and panoramic modes work very well and can be quite useful. Olympus’s implementation of HDR is pleasantly restrained, yielding a low-contrast JPEG that’s great for editing. (You can also use HDR mode 2 for punchier contrast.) Additionally, there’s the AP (Advanced Photo) position on the mode dial which is basically automated versions of advanced techniques, like focus bracketing and multiple exposures (you can also find HDR and panorama here again, which is a bit redundant and confusing). Olympus has made the best possible camera for the smartphone generation, other than an actual smartphone. As for video, it’s nice that Olympus bumped up the quality to 4K (at either 24 or 30 frames per second), but Panasonic GH5S this is not. Detail is sufficient, but the sharpening is a bit excessive, leading to halos around edges when viewed at 100 percent. 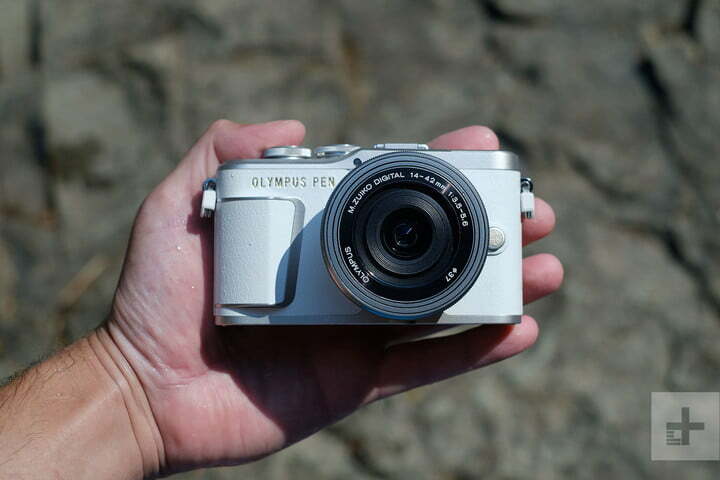 Still, it looks noticeably better than the 1080p on other entry-level mirrorless cameras, such as the Canon EOS M6, and casual users should be happy with it. The E-PL9 also offers two different stabilization modes when shooting video. The default is a hybrid of sensor-shift and electronic image stabilization (EIS), while the second uses just sensor-shift. EIS slightly crops the image, but otherwise does not incur much of a penalty to image quality (likely because fine detail is already somewhat obscured by the heavy sharpening). For this reason, we’d recommend leaving it on for any handheld shots that involve camera movement — whether that be walking, panning, what have you — while using just sensor-shift stabilization for stationary handheld shots where the added stability of EIS isn’t important. If you use a tripod, you can also turn stabilization off completely. Our only complaint about the video modes, from the perspective of a novice user, is that it’s not immediately clear how you access 4K. The quick menu only shows 1080p and 720p; the main menu has no resolution options at all, only frame rates and bit rates. For 4K, you need to turn the mode dial to movie mode and select “4K” rather than “Standard.” Why Olympus chose to bury the feature like this is beyond us. With the PEN E-PL9, Olympus has made the best possible camera for the smartphone generation, other than an actual smartphone. It’s pretty, compact, fast, and simple to operate — great for someone ready to jump into the world of interchangeable lens cameras. As an entry-level model, we have no real complaints, but we’re back at our original question: Will people actually use the thing? This really is a fantastic little camera for travel, kids, pets, and any other type of casual photography. So, we certainly hope so. For beginners, there are a number of cameras in the same ball park, but none with the combination of styling and performance of the E-PL9. However, if you have even an inkling that you’re going to move beyond casual photography into the realm of the hobbyist or enthusiast, then you’re likely better off with the O-MD E-M10 Mark III (or even stretching your budget for the APS-C Fujifilm X-T20). The E-M10 is essentially the same camera as the E-PL9, but with an electronic viewfinder, more advanced control layout, and five-axis stabilization. Thanks to current rebates, it also costs just $599 (body only) or $699 with the same 14-42mm kit lens, so you’re not out any extra cash. Sure, it’s not quite as compact and you don’t get all the cool color options, but it’s the better buy. While not weather sealed like Olympus’s higher-end cameras, the E-PL9 is still well made. Again, our concern with its longevity is more about who you are as a photographer: You will quickly outgrow this camera if you plan to learn and use manual exposure. If you’re okay sticking with automatic, the E-PL9 is probably your best bet for a camera that you might actually use in place of your phone. For casual photography, the E-PL9 is a great choice, but aspiring enthusiasts should look elsewhere. This camera excels in ease of use for beginners, but, somewhat ironically, that same simplicity is what makes it painfully frustrating for advanced users. If you just want a no-nonsense camera to leave in automatic 90-percent of the time, then you’ll be happy with the E-PL9. Wrap your iPhone or Galaxy in a fine Mujjo leather case with our exclusive Black Friday discount promo! November 22, 2018 Tech News Comments Off on Wrap your iPhone or Galaxy in a fine Mujjo leather case with our exclusive Black Friday discount promo!